Peer Pressure - body, Why Do People Respond to Peer Pressure? Peer pressure is the feeling that people get from their friends to conform or behave in a certain way. 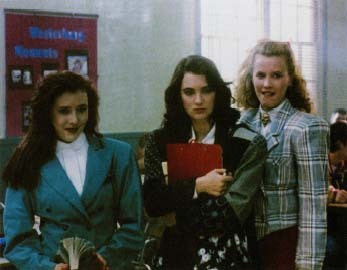 Heathers (1989) portrays a high school in which three girls, all named Heather, use their status as most popular to manipulate and ridicule other students. Veronica (center, played by Winona Ryder) finds herself caught between the Heathers and a rebellious loner at school who seeks revenge on them. pressure. Peer pressure, in itself, is neither good nor bad. It can encourage a person to study hard and get good grades or to skip school, get drunk, or smoke cigarettes. Peer pressure plays a particularly large role in the lives of teenagers. In adolescence young people begin to break away from their families and try out different roles and situations to figure out who they are and where they fit into the world. They spend more time with their friends and less time with their families. This is a normal, healthy stage of development, but the growing distance between parents and their children and the increasing importance of friends can be a source of conflict and anger within the family. The desire to feel accepted and to fit in is one of the strongest forces in adolescence. It can lead teens to do things that they know are wrong, dangerous, or risky. On the positive side, pressure to keep up with the peer group can also inspire teens to achieve goals that they might never aim for on their own. Why Do People Respond to Peer Pressure? strong connections to family and community. are afraid of not belonging or fitting in. How Can People Avoid Negative Peer Pressure? getting help from a trusted adult (for example, a coach, counselor, or family member). Social psychologists have studied peer pressure, examining how it can influence people to change their minds to go along with other's opinions. In one study, people consistently changed their answers from what they knew was a correct response to an incorrect response, just because others (who were part of the experiment) gave an incorrect answer. Experiments like these have also shown that people are more likely to stand their ground about what they know is right and stick to their original answers if just one other person joins or agrees with them. Such studies demonstrate that people can more easily resist peer pressure together, and gives new meaning to the conventional wisdom that the friends a person chooses really do matter. The best way for teens, or for that matter people of all ages, to make peer pressure a positive rather than a negative force is to select friends whose values, goals, ambitions, habits, and behaviors they admire and believe are constructive. Kaplan, Leslie S. Coping with Peer Pressure. New York: Hazelden/Rosen, 1997. A book for young adults that offers suggestions on how to keep peer pressure from controlling your life. Scott, Sharon. How to Say No and Keep Your Friends: Peer Pressure Reversal for Teens and Preteens. Amherst, MA: Human Resource Development Press, 1997. Spinelli, Jerry. Wringer. New York: HarperCollins, 1998. A fictional story about a preteen boy who faces the prospect of having to do something that appalls him just so that he will fit in. Nemours Center for Children's Health Media, A. I. duPont Hospital for Children, 1600 Rockland Road, Wilmington, DE 19803. This organization is dedicated to issues of children's health. Their website posts articles for children, teens, and parents on peer pressure, friendships, and related topics.